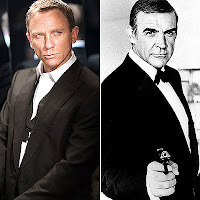 What hero is more iconic, more internationally lauded as courage embodied in fine attire, than the MI6 man of action: Agent 007. Conceived over 50 years ago, with 22 films, several television appearances, and numerous comic book adaptations and videogames, James Bond stands alongside cowboys and knights as one of the most recognizable cultural creations of the western world. Despite his British origin, his success in the US and world wide is a testament to his easily consumable appeal. I bring up the suave spy because I have just recently watched the Daniel Craig iterations of James Bond. Admittedly, I am a bit behind the curve on this modernized version - Casino Royale and Quantum of Solace were released in 2006 and 2008 respectively - but my timing is fortuitous. My viewings of the new bond coincide with my playthrough of Uncharted 2: Among Thieves, whose protagonist, Nathan Drake, shares many characteristics with the British agent. It has become increasingly apparent that Bond's persona permeates the world of videogame characters with startling frequency, but never completely. It might be helpful to isolate some of Bond's characteristics, not all of which are favorable. First, Bond is classy and dapper in appearance. He is always well dressed and seldom found in disarray, even during the most harrowing of stunts. His demeanor matches his attire - Bond is nothing if not a suave gentleman, a man who tips well, comports himself with dignity in every public venue, and is never rude. Ladies flock to Bond like flies to a bug-zapper; his chauvinism is rewarded with sexual attention. Yet he does not forget himself in the company of women - his job comes first. Bond is emotionally distant. His violent acts are brutally efficient. As Vesper Lynd remarks about Bond in Casino Royale, "there is something cold and ruthless" about him. He is also incredibly knowledgeable, accomplishing most tasks with ease. These last characteristics in particular are common place amongst our catalog of videogame adventurers. 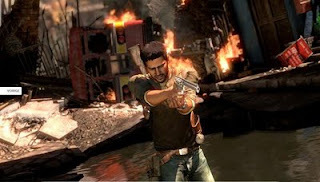 Uncharted 2 is my first stop on my search for the most James Bond like videogame protagonist. Nathan Drake's knowledge of geography and ancient languages rivals that of Indiana Jones. Drake's uncanny ability of all types of weapons and his amazing climbing skills would make 007 proud - Bond once saved himself from a cliff's edge with his shoe laces. He's also got a charming demeanor, a thirst for adventure, and a knack for killing. However similar, Drake still lacks the fastidious gentlemanly appearance and emotional distance of Bond. Perhaps the delightful Professor Layton is most akin to our genius foreign agent. The Professor is every bit a gentleman, maintaining a well pressed suit and top hat for all occasions. He is always mindful of ladies and is kind towards strangers. Layton is also a mysterious fellow, surprisingly adept with swords for a puzzling Professor or Archaeology. However, Layton is no ladies-man, nor is he a trained killer with the emotions of an ice sculpture. Like Bond, Layton strives for good, but he does not commit evil to attain it. We will have to go back to the 12th century for our next Bond hero. Altaïr, of Assassin's Creed, matches the profile fairly well. 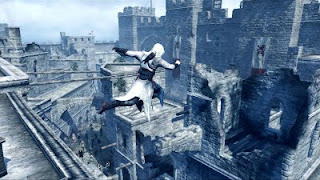 A skilled assassin with stunning climbing skills, Altaïr masters his surroundings with Bond-like precision. For the majority of the game, his profession is of the utmost importance. His is an unquestioning killer of men; a task he undertakes with frightening resolve. He's also got a sparkling white get-up that he seems never to sully. But Altaïr is just not as easy to like. He also lacks the charm and masculine wiles to pursue and abandon women with Bond's regularity. We can go to The Witcher's Geralt for his cavalier approach to women, but even he will be found wanting. Master Chief, the Prince of Persia, Mattias Nillson, Solid Snake, Squall, Sam Fisher, and even Faith are all Bond-like in some way, without encapsulating all of his characteristics. There are, of course, plenty of actual James Bond games -Activision currently holds the rights. GoldenEye 007 is the most well known title, but even this N64 game doesn't master the Bond persona. James Bond is at once unique and completely trite. In cinema, he represents the embodiment of success, a protector of western values imbued with the charisma and aplomb we wish we could muster. He is the quintessential hero for a masculine and violent world. In videogames, he is a collection of the pre-established heroic qualities from which creators often cherry-pick. Whether Bond indirectly inspires game creators, or they happen to pick these characteristics freel,y does not really matter. Regardless, if we were to collect all our adventuring protagonists and mix them into one being, James Bond just might pop out. A fact remains true for countless games: There is never any doubt we are playing a hero, an individual incapable of loss, who faces inhuman risks, whom we are encouraged to admire, even envy, and is willing to do almost anything to achieve his goal. On an individual basis, this is not necessarily a bad thing. It is when I look at a wider picture that I become nervous. Maybe it is because the movies are fresh in my mind, but I am seeing Bond everywhere in games. His cavalier approach to wanton slaughter, his emotionless attitude, his ravenous pursuit of a goal. These, among his other traits, are common place amongst game heroes. Unfortunately, I may be growing tired of this particular brand of heroics. Great and interesting exploration of the Bond-fever found in videogames. I imagine Bond is present in so many videogame characters because he represents, as you mention, Western hegemonic masculinity. This made me think about how scary it is that these "creations" lack so much variety (and thus creativity) as they often reinforce a type of masculinity that isn't the most conducive for gender equality. This makes me ponder some questions that you guys and others might be able to offer some insight on: Are there many videogame characters being produced these days that represent more subversive forms of masculinity and gender? Why don't we get more variety in this area and what will it take to get more variety? I think there's also an interesting divide to be looked at in that Bond is a particularly British action hero. If you see him as an icon of that culture, it's not enough to be physically adept, but also intelligent, classy, witty, etc. 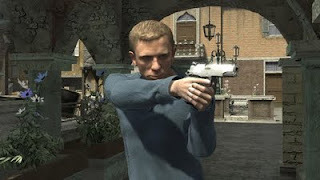 Contrast that with the Clint Eastwood western hero or Bruce Willis Die Hard hero; working class guys with some ingenuity and personality but mostly brute force, which trickles down a lot more often to western action games like Uncharted, but also GTA in particular. For the American sensibility it's about rising to a challenge through toughness than the British, which seems to be more about being above any challenge no matter what it is. As always, great post!, I feel as if videogames are still very close to the concept of hero from the old epic stories, such as Beowulf, The ring of the Nibelung, The song of Roland, etc... where the main heroes follow certain characteristics, such as having an active role in war and imposing themselves (along with their masculinity and ideology) through combat, or becoming the image of what a men should be for others to follow. Shepard from Mass Effect could be a good example; he is transformed in the hero of humanity when becomes a Specter, he is the image for the hole humanity to follow, and through his actions in combat, saves (and imposes) humanity in the global ideology of the galaxy. Although the player has options in the way he acts ("good" or "bad") I don't think that they change much of the concept of hero that the game tries to set, as for the option of playing as a female character I'm not really sure how to adress the subjet, Bioware set the image of Shepard as a male, and seems like such image has become canonical. I think James Bond is very similar to this old formula, just as you said, his characteristics make him a men many would like to become, but much of his valor as a hero (and as any other hero) comes of the enemy he must fight, for James Bond it was the russians, for Indiana Jones where the nazis, for Leonidas where the persians, and so on. What I'm trying to say with all this mad mumbling, is that I feel as if videogames (just on a part) are having a hard time in making a contemporary hero, similar to what literature and cinema have archived. The most regonizable heros from videogames are from imaginary realities, and the videogames that set stories with a time that we can relate to as contemporary, either don't even try to create a hero (such as GTA IV, or Farcry 2 and rather create an antihero), or give us a very delicate and ambiguous subject (such as Call of duty modern warfare). Perhaps game designers look at the heroes from literature and cinema, and thus we get a lot of James Bondes and Indiana Joneses. I haven't played any of the Uncharted's or Profesor Layton's series, so I'm not sure about the way this characters are made, but I wonder if it's posible for videogames to make their contemporary hero, or in any case, if it matters at all. The variety question is, in some ways, an easy one. The industry is dominated by males and is largely a self-reproducing organism that recycles masculine dominated imagery. Bond is a pin-point example of that phenomenon from the film industry. At least the film industry is more diverse, however. There are outliers, but they take some finding. Bond is definitely of his British origin. I like the Eastwood and Willis examples, since there are plenty examples of the gritty/gruff hero in the games industry. They are, as I see it, iterations on the same heroic trope. I chose Bond because I saw the films recently, but Bond's suit of characteristics are applicable across the spectrum. We might produce less suave, but we have make game heroes that include many of his, and Willis's, and Eastwood's other traits. Oh yes, the classic of heroes of Yore never quite go away. For good reason, partly! But some of our mixed-bag of characteristics need altering. I also think there is something distinct about Bond as a protector of Western ideology and civilization that is unique to his era. But I'm not as fluent with ancient texts. I love that you bring up Mass Effect, because I think its a unique case. Firstly, my Shepard was female with a huge facial scar and some bad war stories. She was intelligent, but also far more sympathetic to others than the Bond hero, preferring to talk down enemies whenever possible. Which brings me to your last point about contemporary heroes, that probably deserves a whole other post. What is our contemporary hero? In film, Jason Bourne is our modernized Bond (from which Daniel Craig draws inspiration btw). Game setting aside, who do we base a new model off of? Maybe someone accidentally in the situation? The less skilled and more devoted? Those who survive by luck alone? I don't know what to put in my sack of heroic characteristics. Which is important to keep around. After all, I do like heroes.